The weekly "Who Cares?!!? "segment is back again to chronicle the least-cared about stories in sports. So here we go. As always, please vote at the bottom to tell me which story you care least about this week. 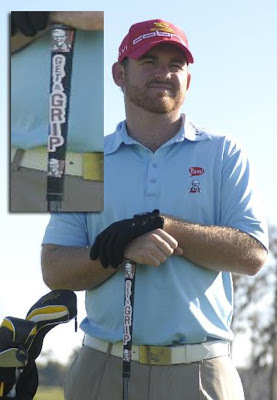 1) Golfer JB Holmes gets a KFC grip. Last week, Holmes - along with NFL receiver Jason Avant and budding tennis pro Devin Britton - announced a deal that puts the Colonel on his golf grips. Some pictures from the KFC photo shoot below. There's also video of the shoot here. What space is left ad-free for these walking advertisements, I mean, golfers? No idea how far Holmes can hit a KFC boneless filet. If you're ready to vomit in your mouth, here's what Holmes said in the press release announcing the deal: "I'm always looking for game-changing ways to improve my performance on the course. That's why I'm thrilled to partner with KFC to launch the new Boneless Filet - a game-changer in its own right when it comes to eating chicken." Really? Really. 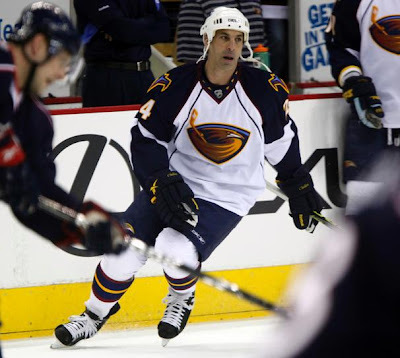 2) One of hockey's longest careers resumed last night as 48-year old Chris Chelios returned to the NHL to play in a game for the Atlanta Thrashers. Chelios, who started his career with the Montreal Canadiens in 1984, has also logged time for the Chicago Blackhawks and Detroit Red Wings. He is also the second-oldest NHL player ever and the oldest to ever win a Stanley Cup (in 2008 with Detroit, at age 46). In a battle for the Eastern Conference's final playoff spot, the Thrashers recalled Chelios from their AHL affiliate on Wednesday. Why isn't Chelios' helmet strap buttoned? Could it have been a senior moment? Unfortunately, the Thrashers dropped last night's game at the woeful Columbus Blue Jackets, by a 2-1 score, their fourth-straight loss, to fall six points behind the Boston Bruins for the final playoff spot. So, how did Chelios fare in his first NHL game since the conclusion of the 2008-2009 season? In his 10 minutes of ice time, Chelios was partially responsible for the Blue Jackets' first goal (above). While attempting to kill a penalty, Chelios was tried to block a pass across the goal, but the puck ricocheted off his pads and past Thrashers goalie Johan Hedberg. Not to worry, though, Chelios will have a chance to redeem himself when the Thrashers host the New York Rangers tonight. But, with just 16 games left in the NHL regular season, Atlanta needs to make a pretty dramatic run to make the playoffs. 3) On Friday morning, Coolidge High in Washington, D.C., will make history by naming Natalie Randolph as its head football coach. Randolph, the first female head coach in the country according to the National Federation of State High School Associations, is a former University of Virginia track athlete, a former National Women's Football Association WR, and a former assistant football coach at H.D. 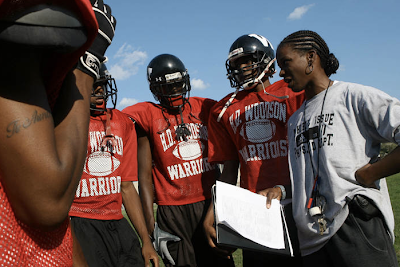 Woodson High in D.C.
Randolph, coaching at Woodson, is being called a pioneer. At Woodson, head football coach Greg Fuller said that Randolph earned respect across the board. He added, "Honestly, I don't think she'll have problems with (the players or the parents), because she knows the game and I think she proved that point." Interestingly, this topic was discussed on ESPN's First Take this morning with NFL player Keith Bullock taking the lead on dismissing the effectiveness of a female football coach. Rather than substantively criticize her qualifications, however, Bullock's approach was unwaveringly sexist. Doug Stewart, a sports radio host and regular on the show, added that one thing a female coach could bring to a team would be that after a tough loss, a female coach could "bake cupcakes" to comfort her players. I doubt this story is done, just yet. So, which sports story do you care least about this week?